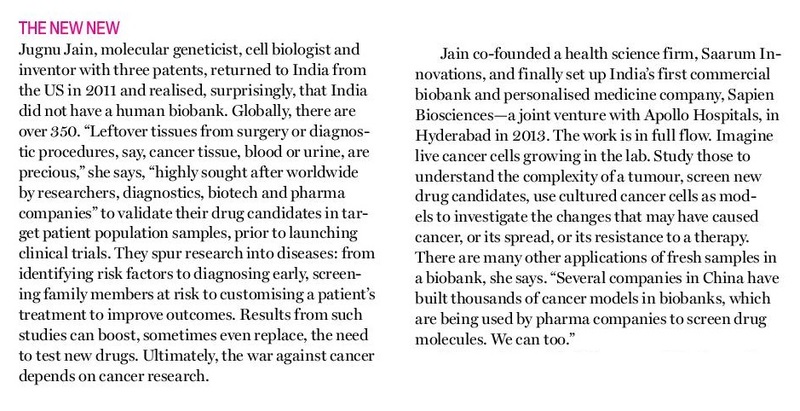 Excited to share that our Biobank at Sapien Biosciences and the patient cancer-derived cell models developed by Saarum Sciences Private Limited were covered by India Today as part of their COVER STORY devoted to innovation in India in the fight against Cancer (26th June issue). Kudos to Damayanti Datta for putting together a detailed summary for lay people to better understand the concepts and buzz words doing the rounds, and to India Today for in-depth coverage of science and healthcare. Big Thanks to Aroon Puri for citing us in the EDITOR’S NOTE as well.